Being able to quickly upload a HTML5 game to the web is important. It's not just a more comfortable format for sharing, but sometimes a requirement, since games created with GameMaker: Studio, Construct 2, Haxe+OpenFL and many other tools may not necessarily fully function when launched locally due to browsers laying restrictions over local file access (meaning that sending a ZIP with game files may not quite work). While it used to be possible to host HTML5 games on Dropbox for free (or, rather, it still is possible, but only if you have enabled the public folder before the late 2013, else it'll cost you some), you can still host HTML5 games freely on Google Drive. 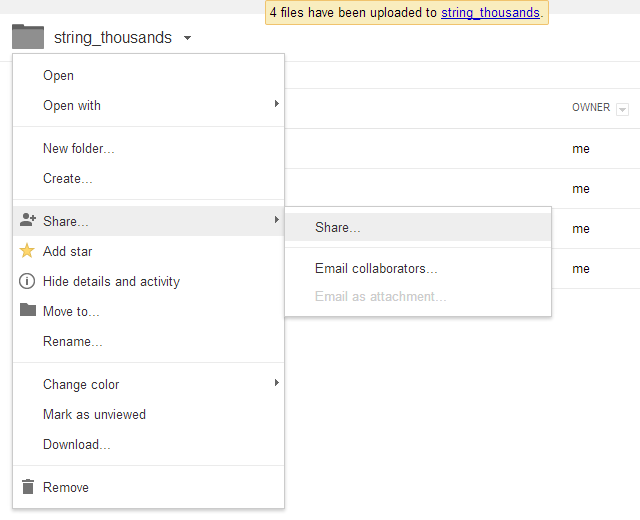 And this article explains the process of hosting your games on Google Drive in detail. First things first, you need to login to Google Drive (obviously). If you have a Google account, you should already have that set up automatically. Location and name of new folder don't really matter, but you should generally try to sort your folders based on some criteria instead of dumping them in "root" folder. 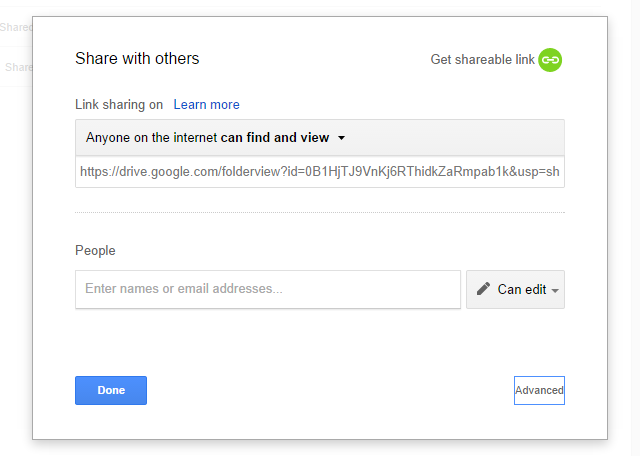 Update (September 2014): Now a slightly different sharing window is shown (example), where you need to click "Advanced" first. By default, folder access is set to "private", meaning that only you can access the contents. Since this is a folder with game, that is not the right option, and should be adjusted by clicking the "Change..." link next to it. Here you need to set permissions to "Public on the web" + "Can view" and hit "Save". Once "Save" is clicked, you are taken back to "Sharing settings" window, which will now display updated information. While it may seem that all is done, the "link to share" is not the one you need though - that just displays the file list from folder, which is no help to running the game. This is also the URL that you can later share with someone (example). And that's it. A link to the game can be later shared with players/potential sponsors/whoevever, and will work as long as the folder is on your Google Drive and has permissions intact. Does this still really work? It should still work until September. Tried to upload a C2 game but doesn’t seem to work. Getting the error below now. Thanks for the info anyways. I’m getting the error too… seems google have already started stopping hosting for some accounts?? I followed these instructions but as soon as I upload my game the index.html file gets flagged by Google “for abuse”. Has anyone else had this problem? has anyone got this to work with unity games? just followed the instructions and using a game I published in Construct 2, it worked! it doesn’t seem like this is working for me. I just get the folder view. never mind. now it works. doesn’t work : I have a “-” in the code. Maybe it’s the reason? This is actually quite complicated than it should be. I’ve been having a 404 error since this morning. Even me going on the forums isn’t working. The author needs to update this more because there is no ‘Google Drive host’ any more; and after the sharing part, it actually becomes quite confusing for those who are visual. Thanks Mate, .. it’s work perfectly. I did that and it opens the game normally when i use the link but it stucks when its loading the game… Anyone having the same problem? I used construct 2 to make the game. 12/10/2014… just tried it and it works like a champ! Thanks for writing this article!!! It doesn’t work at 25 november 2014. there is no googledrive.com/host where you can paste the id(+/index.html)…and anyway when i click the link it shows the content instead of opening the index.html. The transformation of the link (in the navigation bar doesn’t happend)…your example works…because the link was created before the changes?? There’s a thing though – folders can take a few minutes to actually become accessible. And if you attempt to access them within that time, it gives you a 404 message and changes the link into “drive.google.com/host/…”, which will actually never show the files. So, ensure that you are not trying with a broken link, and/or do wait a bit. does not work does not…. When I click on the link, it shows me the content instead of opening the index.html. Is it possible that it doesn’t work anymore(I think Drive had an update recently)? When I click on the link, it shows me the content instead of opening the index.html. 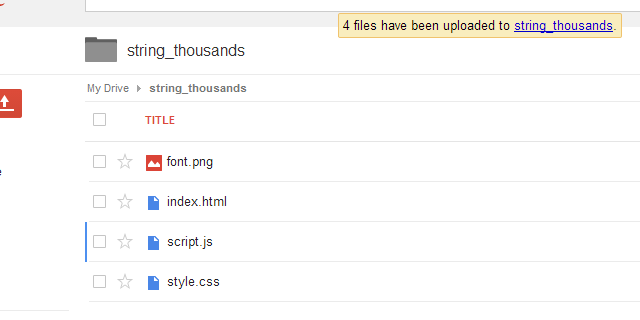 » There recently were several “hickups”, where websites hosted on Google Drive became inaccessible for a short while. 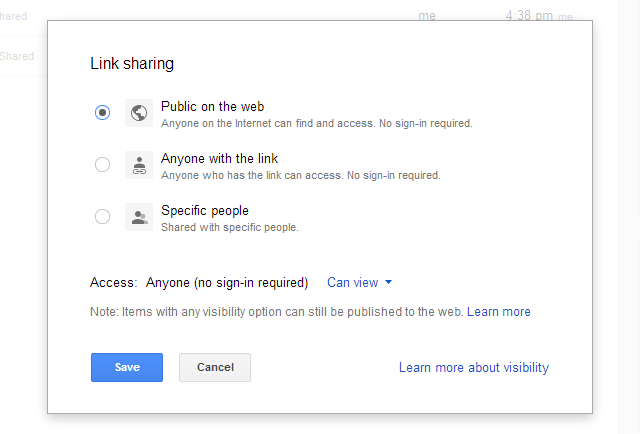 » Looking at it, apparently “Sharing” dialog has been changed recently, and now takes another click to get to settings. I’ve updated the post with information on this.